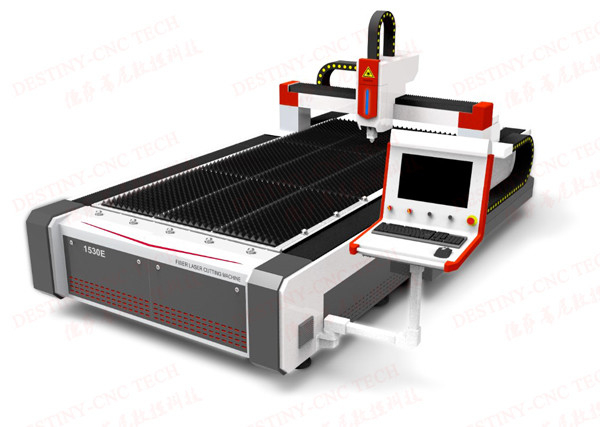 DT-1530 Heavy duty Fiber 1000w laser cutting machine adopts the most sophisticated laser source, combining Gantry CNC machine designed by our company and high strength welding body, after high temperature annealing and precision machining by large CNC milling machine. It has good rigidity and stability with high precision ball screws, linear guide drive run. It is mainly for cutting sheet metal in high speed and high precision. Fiber laser has a series of advantages, such as high beam quality, high brightness, high conversion rates, maintenance-free, stable and reliable operation of low cost and small size, etc. Air-assisted cutting is the most advanced level of laser cutting.